I ran my 5th marathon on a whim last Sunday. This is something I would normally never dream of doing. I had trained all Summer long for Chicago, but after warm temps and a disappointing 4:00:12, I had a crazy idea and found myself, 5 days later, looking at the course and elevation profile of the STL RnR marathon. Two weeks after missing my first sub-4 hour marathon by 13 seconds, could I do it? Could I set another PR and get under 4 hours? Common sense says no, but I signed up and gave it a try anyway. I didn’t speak much about trying to get sub 4. I didn’t want to hear any negative talk (also known as common sense), so I kept fairly quite about it. I decided this time to start with the 4 hour pace group and just see what happened. I told myself (and my wife) that I would be satisfied with anything under 4:15. I was about to pull a little stunt and simply finishing with a respectable time and not injured was all that was really important. I started with the 4 hour group in corral 7 and immediately they were going too slow, so with the help of my trusty Garmin 305, I pushed on myself. I attacked the downhills when I could and ran a very comfortable 9:00-9:05 minute per mile pace (I ran 8:45s at Chicago thru 18 miles). I felt like I was pretty far ahead of the 4 hour group when, suddenly around mile 15, I heard the unmistakable sound of about 20 runners running at the same pace begin to overtake me. Hmm? I was ahead at this point and was surprised to see them. I was pretty sure they were banking time with a few considerable hills yet to come. I hooked up with the group and pushed on through some very tough miles. 18 through 20 or so was a GRIND. Relentless, never-ending, slow climb. Just when i thought it was done, I turned a corner to find it continued up. The second half of this course is way more challenging than the first. I made it until around mile 23 and then I had to start taking short walk breaks. I was still on pace, so I’d take a quick break and then run a bit faster to keep the 4 hour mark within reach. I watched my Garmin as my average pace slowly dropped from 9:02 to 9:03 to 9:04. It was starting to slip away. Was it going to happen again?! I couldn’t let it happen again. I couldn’t get this far and give up. I ran, took a quick walk, ran, took a quick break, repeat. The 4 hour pacers were still well within sight. I did it. Unbelievable. After 3 serious attempts at a sub 4 hour marathon, I made it. 4:01:30, 4:05, 4:00:12, 3:59:14. I’m so glad to have this monkey off my back. I also did it in incredible (don’t try this at home) fashion. 2 marathons in 2 weeks. The second faster than the first. A sub-8 hour double marathon!! Going into the 2011 Chicago Marathon, I had a very specific goal in mind – one that I had trained for all Summer long – a 3:50 marathon. I had missed a sub 4 hour marathon my last 2 attempts by minutes. I knew I could do it, so I pushed myself and set an even faster goal. Going into the race, even the Saturday before, I felt comfortable and confident that I could do it. The limiting factor was going to be how well I could handle the less than ideal warm temps in Chicago on October 9th. The temperature at the start was around 64 and pushed into the mid 70’s by the time I finished. Sounds beautiful, right? Not for a marathon runner. Not only did I not make my goal of 3:50, I missed a sub 4 hour marathon by 13 seconds. Just one less walk break and I would’ve done it. Disappointment. It’s very easy after a race like this to go back in my mind and think that I could’ve done it. Just ONE less walk break… but I know that’s not how it works. I didn’t want to stop and walk, but I had to. 4:00:12 was everything I had this past Sunday. I gave it everything up “Mount Roosevelt” at the end as I fought off the cramps one last time. That was all I had and I have no regrets. I absolutely cruised through the first half, right at my goal pace of 8:46 per mile. I was literally closing my eyes and going with the flow of the pace group. It was easy. I was conserving as much energy as I could. I wasn’t even taking in much of the unbelievable crowd that turns out every year for the race. I was focused. I usually joke and talk to as many people as possible during these races, but not this time. I was in the zone. Once I got to mile 14 I was taking stock of where I was and how I felt. I didn’t feel bad, but I certainly didn’t feel perfect. This was crunch time and I was able to hold it together from 14 – 18, but then the wheels quickly came off. In the early going, I was running through the aid stations, while still doing a good job of staying hydrated and cool. Now it was time to walk a bit during the aid stations. Soon after than it was time to walk when the cramps started to take over. I referred to this a “cramp intervals”. Go as far as I could, let the cramp (calf or inner thigh) take over, stop, walk it off and then run again. I couldn’t even make it all the way through the last mile. Awful. I had 10 minutes in the bank through 18 miles and I had to let that go. I thought that I still maybe would make it even though I saw a few folks with 4:00 pace signs on their shirts. I gave it one last go at the very end and just came up 13 seconds short. So it goes. I never felt warm or over-heated at all, but at those temperatures, I just can’t run as fast and as far as I could if it would’ve been 50 degrees. While I’m still disappointed with my race, I know deep down that I did what I could given the conditions. I did have a very good blood glucose management race. Wasn’t even a factor. The only thing I had to do was completely turn off my pump around mile 20, because I was starting to have trouble eating and taking in calories, so I couldn’t risk going low. That worked out well and I finished around 120 or 130. I do want to give a shout out to my wonderful wife for being there and being supportive throughout the race. She has got Chicago Marathon spectating licked! She was at miles 3, 12, 22 and even ran over to catch me at 23. I couldn’t wait to see her at 22. Unfortunately, I had to tell her that the wheels had fallen off, but most importantly I wanted her to know that I was ok and would make it in fine. I’m smart about not pushing too hard and listening to my body. A sub 4 hour marathon is important to me, but not as important as my family. “The hay is in the barn” is a term that I first came across a while back on one of my favorite podcasts, The Age Grouper triathlon podcast, and I had a friend make this comment on a 17 mile run I did a few weeks ago. It has really stuck with me during my Chicago Marathon training. The gist of the saying is that all the hard work and training is done and now it’s time to race. I’ll be running my 4th marathon and my 2nd Chicago Marathon this coming Sunday. My previous marathon times are 4:34 (Chicago 2009), 4:01:26 (Memphis 2010) and 4:05:54 (Carlsbad, CA 2011). In my last two attempts I’ve missed going sub-4 hours by a total of 7 and a half minutes. My goal on Sunday is 3:50. I KNOW I can do sub-4, so I’m going to push it a little and see what happens. I’ve trained for this pace and I’ve run faster than ever this Summer… the hay is in the barn. This Summer I decided to really focus on getting a sub-4 hour marathon off my back. No triathlons during training this time. This time the focus would solely be on running. In the process I’ve knocked out some PRs and even placed in a few races. I ran a 20:52 5K on a tough course to get 2nd in my age group and also ran a 46:06 10K to win my age group and come in 2nd overall (yeah, it was a small race, but 2nd OVERALL is amazing for me!). It’s been a great Summer of running. I’ve been in taper mode for the past 2 weeks and have one week to go. It’s tough during a taper to just relax and remember that all the work is done and to trust in the training and come race day I’ll be ready to go. Last week I had a bad 17 mile run and it crept into my mind, how I’ll be able to do 26.2 running faster. But I have to remember that those 17 miles were coming off the peak of my training and I SHOULD be tired. If I wasn’t then my training might’ve been lacking. I have to trust in my training and rely on the taper to let me recover and be able to knock off 26.2 in 3:50. I’ve been at this for 10 weeks, I’ve run over 420 miles, the hard work is done… the hay is in the barn. I’m having problems coming to grips with the idea of getting and BEING faster. I still consider myself a slow 6’4″ guy. I just can’t get past that idea, but I suppose running a 20:52 5K means I need to drop the “slow” descriptor. This past Saturday I ran in my hometown’s 5k – the Waterloo Optimist’s Club 5k. It’s on a course that I run all the time in training. It’s also a very hilly course for a 5K. My goal was sub 21:00 and given the small nature of a local 5K I had hopes of at least a 3rd in my age group. I managed to go sub 21 with a 20:52 (6:46 pace) and got 2nd in my age group. I finished about 3 seconds behind the 1st place finisher in my group. I gave it all I had… I didn’t have enough left to make it a real race at the end. “Racing” is something new and something I’ll need to work on. These fast 5Ks aren’t really my thing, but I can say I was pretty pumped to see 20:52 as I crossed the line. On a downside though, I ran so hard I could only eat half of a post race bratwurst. 😉 It’s a tradition. Next up is a little race called the Bank of America Chicago Marathon with 35,000 of my closest friends. I have 6 weeks to go and I’m in the middle of my biggest week – first of 2 20 milers and 55 total miles for the week. I’m very happy to report that my training is going very well. I had a little pain on the inside of my lower left leg last week, but after some icing everything is back to normal and I’m feeling good. I have been running in my Newtons (one of our awesome sponsors for Glucomotive) and absolutely love them. Can’t wait for our trip to Chicago and running a 3:50 marathon in them on October 9th! A few weeks ago I ran in my 3rd Ragnar Relay at the Ragnar Relay Northwest Passage. This was also my 3rd relay with Insulindependence (IN) and Glucomotive. I feel very lucky to be able to do events like this. First of all, I CAN run nearly 15 miles over the course of 24 hours despite having Type 1 Diabetes. Secondly, I have a tremendously supportive family that allows me to do these crazy adventures… OFTEN. And lastly, I’m humbled by the support that is given to me by friends, family and strangers that donate to IN to make events like this possible. Our team, made up of 12 Type 1 Diabetics athletes with Type 1 Diabetes ran from Blaine, WA to Whidbey Island, WA in 26 hours, 53 minutes, and 37 seconds. That’s an 8:29/mile pace for 190 miles! Not bad for a bunch of people that can’t produce their own insulin! My trip started out a little differently this year. My good friend and little diabetic sister, Emily, came to St. Louis to visit me and my family the Weds before going out for the race. We enjoyed (??) a ridiculously hot and humid run and some carb loading Weds evening and then headed for the airport bright and early to get on a plane at 6 AM on Thursday in search of much nicer running weather in the Pacific Northwest. We were greeted with the stereotypical Seattle weather, light rain and upper 60s, but that all cleared off and we enjoyed pleasant temps, sunshine and perfect running weather the remainder of the trip. After spending some time in downtown Seattle and having our first meal with the whole group we headed north to spend the night in Bellingham, WA. Thursday evening we went out for dinner, made a trip to Walmart to pick up some decorations for the vans (our 2 enormous white vans), and tried to get some rest before the race. Note: After waking up Friday morning, I would only get about 30 minutes of sleep until Sunday afternoon. Our race got started promptly at 9:15 am in Blaine, WA right by the Canadian border. This time I was in the first van, along with Brennan (IN staff member), Sarah, Kelly, Emily and Caroline, so we would be on the course first. Bang! Off we go! I was runner 3 and my first run was 8.5 miles including 550+ ft of elevation gain. It was essentially a gradual 8.5 mile climb. I’m not exactly sure what it was, but this turned out to be one of the best runs of my life. The weather was perfect and I just felt great. I ran a solid 8:29 pace and wanted to bottle that up and take it home with me. My next run was around 8:00 PM Friday evening (I think. Time gets a little questionable during Ragnar). I had 3.4 on tap and set out with a sub-7:00 pace goal. Total time? 23:55. A 6:57 pace AND I had to stop at a red light! I freakin’ love doing Ragnar Relays. Throw in doing them with 11 other amazing folks with diabetes and I’m in heaven. Brennan took on the driving duties for much of the race and then I took over while he and Emily were running. I took advantage of this time to harass them as much as I could. During Brennan’s night time run Friday night, I took EXTREME pleasure in pulling over and giving him trouble as he ran by. I also kind of enjoyed making a van full of tired, slap-happy, girls laugh. Oh, and yelling “Nice pancreas” from a big white van to a girl running down the road might be frowned upon in most cases. While I only got 30 minutes of sleep Friday night/early Saturday morning, I did enjoy laying outside in 50* weather in a sleeping bag at Some State Park in Somewhere, WA for about 2.5 hours. The other thing I enjoyed about those 2.5 hours, was the fact that I didn’t immediately have to get up at 3:00 AM to go run 7.8 very difficult miles. Sorry Caroline! Peanut M&Ms that have may or may not have been rolling around in the back of the van taste just fine. I can’t WAIT to do Del Sol again this coming February with the Glucomotive Capatians! 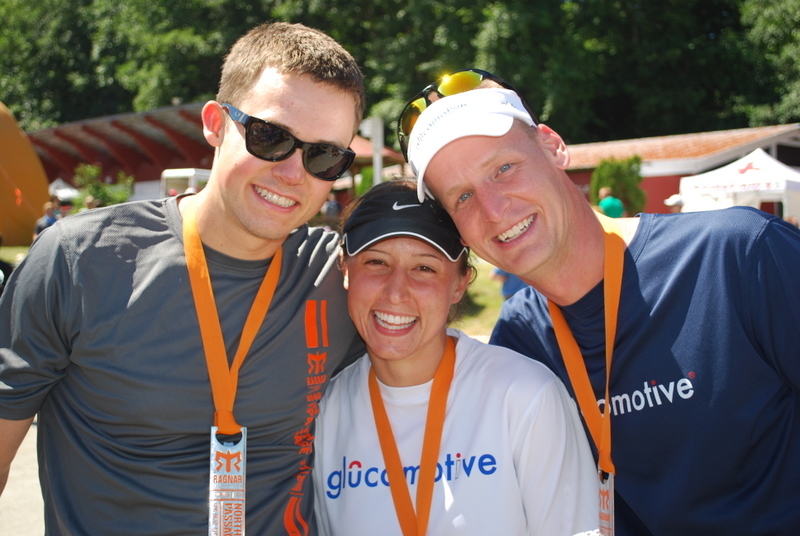 Glucomotive is the running and walking club of IN. I have come to realize, after a fantastic speech by IN Board Member John Gallagher (principal of Gallagher Associates) at Insulindependence University, that Glucomotive has an amazing future ahead of it. Glucomotive is not just reserved for marathon and ultra-marathon runners. It is open to everybody and anybody with diabetes that is looking to live a healthy and active lifestyle through walking and running. When Mr. Gallagher said this, my eyes really opened up and realize that the sky is the limit for this group. This season, 2011-12, IN is having Glucomotive Captains just like Triabetes has in the past. 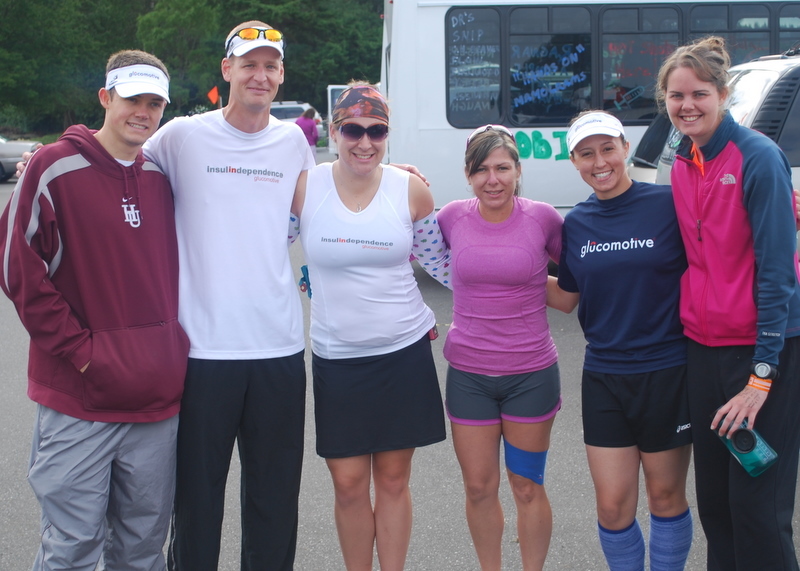 We recruited 8 fantastic individuals to act as Captains for this season, culminating with the 2012 Denver Marathon. Each Captain is raising $4,000, will be hosting monthly events in their own communities called Dawn Phenoms, and will also be mentoring a child with Type 1 Diabetes. Powerful stuff. This past week all the Insulindependence clubs (Glucomotive, Testing Limits, and Triabetes) met in San Diego for Insulindependence University (U of IN). This was a week long training session for the Captains to help them go out and fulfill their responsibilities as Captains. I’ll go into more detail in my next blog post, but just let me tell you this was an amazing week and provided tremendous learning opportunities for everybody. IN is a life changing organization and there are so many amazing folks involved at the core. I’m tremendously honored to be serving as the Glucomotive Club Manager and looking forward to being a part of it’s growth. Please consider making a small donation in my name in support of IN. You can donate here. In July I will be running in the Ragnar Relay Northwest Passage 187 mile, 24 hour race along with 11 other athletes with type 1 diabetes as a part of Team Glucomotive. I will be running 3 different times over the course of 24 hours, covering approx. 18 miles total. I am raising money for our sponsor, Insulindependence (iD) and I need your support by making a donation to this fantastic organization. iD changes lives by helping individuals of all ages with diabetes overcome challenges and fears. Children with Type 1 Diabetes have a special place in my heart and iD has a number of amazing programs that help mentor and inspire kids living with this terrible disease. This will be my 3rd Ragnar Relay with iD. The previous 2 races were incredible learning experiences and have provided me with friendships and a life-long support group. By supporting me, you will also provide the opportunity for others to have this same experience and to live life to its fullest despite living with diabetes. Please consider making a tax-deductible donation to help support me and Insulindependence. My teammates and I are each required to raise $800, so ANYTHING you can give would be tremendously appreciated. To make a donation, visit my donation page here.